This is Georgia and Her (seal) Litter Mate Arrluk. What do you think about her Color..? Take Notice of her Coat and how it looks Dull and BLUE compared to the Seal Male (her Litter Mate) being held next to her. 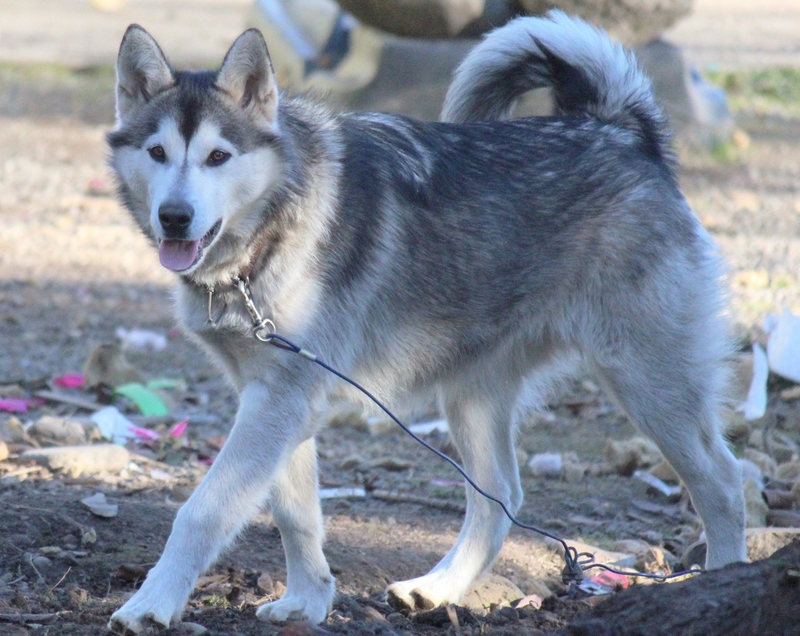 I am dedicating this page of my site to the discovery of facts of the Blue Malamute. I am going to be adding new Material as I build this Page. Please if you are looking to pay high dollar of a Blue Malamute, Please do the research and make sure you are actually buying a Real Blue Malamute. 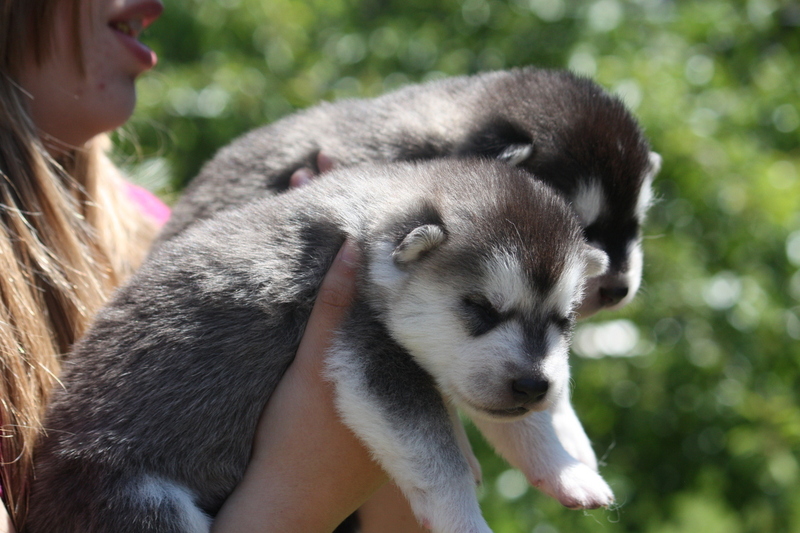 On June 12 2011 one of girls Gave birth to a Female Puppy who has all the characteristics of a Blue Alaskan Malamute. I have been in contact with some people who have done research on the Subject of the Dilute Blue Gene in animals…. 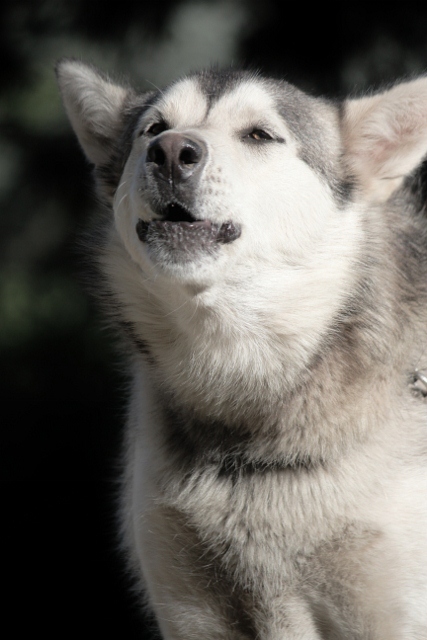 Not experts on DNA, but as much experts as can be found on the Subject of the Blue Malamute. There is Very little know about the Color of the Blue Malamute and were the color originates from or why it exists, and the Blue only appears in History Book of the Malamute. When there have been pictures and information on the Blue including the AKC, the description is as such. (colors) (a light brown color with a tinge of green or gold, like a ripe hazelnut)… This is the written description of the Blue Malamute. The Color is Not Black and not Gray, it is Slate Gray giving the Dog a Blue look. 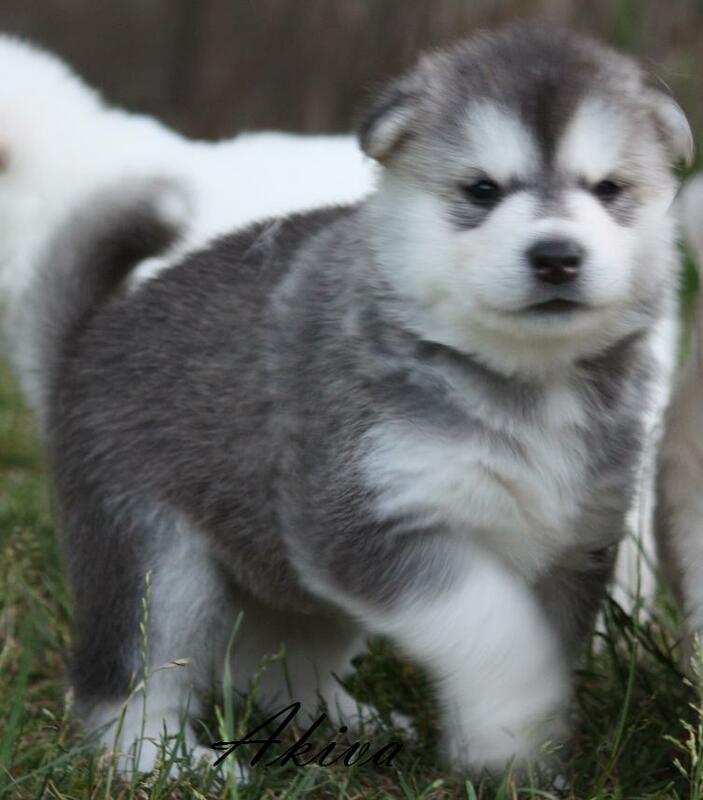 I am going to find as much information on this subject as I can, as I think there are people out there who would pay high dollar for a Puppy expecting to get a RARE and Unseen colored Alaskan Malamute Puppy… when in fact they are not getting anything but ripped off. I have been told my Puppy is in fact a BLUE… She has all of the characteristics of a Blue Alaskan Malamute. However this Puppy is NOT FOR SALE. On June 22 2011, I sent for a DNA Test on my puppy to see if the dilute Gene is in her DNA. 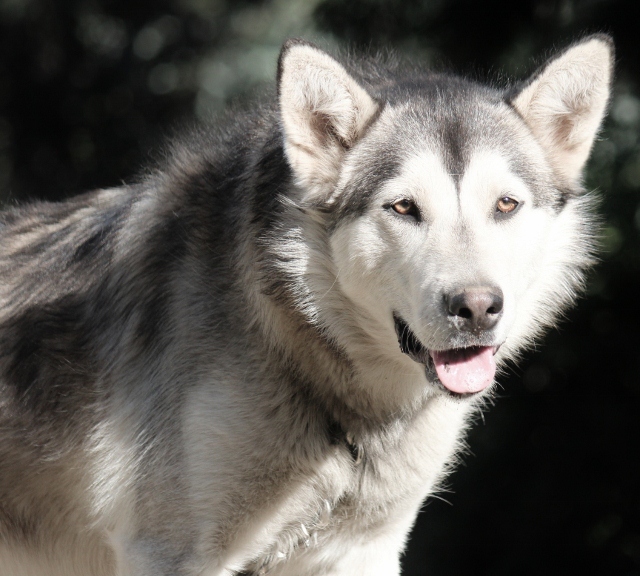 I have been told, with the fact there is not much known about the BLUE Malamute and this test has never been Performed on a BLUE Malamute before, it might not Prove anything, other than she does or does not carry a Dilute Allele. also called the "blue" locus. The recessive allele at this locus changes black (eumelanin) pigment to dark slate gray wherever it appears on the dog. It also takes the red out of the red/yellow (phaeomelanin) pigment, lightening it somewhat and making it appear dull. The black band in the coat as well as nose and skin pigment is unaffected and remains BLACK. The black band is changed to dark slate gray. Pigment on nose, eye rims, lips, and pads are also changed to dark slate gray. Eye color is yellowish or hazel, sometimes with a gray or bluish cast. (a light brown color with a tinge of green or gold, like a ripe hazelnut)… If you do not have the Slate Gray Pigment then the dog is not a true Dilute. As the dog grows from Puppy to Adult some of the pigment can look black or very dark. This is what the DNA Test I am having done on my Puppy will do. I am NOT doing this test to Prove she is a Blue, but to learn more from the Tests and to help with Research on the BLUE Malamute. This Page will grow, as my Knowledge of the Dilute Gene Grows. I will post results of the Tests that are done with my Puppy. She will Never be put through ANY Test that causes her Discomfort or Stress. The Test that is being done for the DNA is a Swab Test, which will swab her cheek and will not cause her any discomfort. 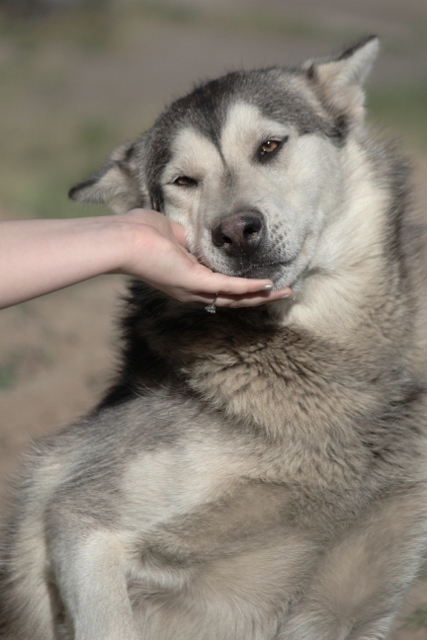 I am very excited to learn as much as I can about the Blue Malamute and what its make-up is. Please keep checking back, as I am going to try to compile as much information as I can. If you are looking for a Blue Malamute, Make sure that the Breeder you buy from, knows the Truth and have done the Research on them, themselves and can back it up. There are some who have taken Copies from other sites and posted it to their site to make it look like they have done the Research themselves, when they have not. I am going to be adding information from other sources, but I will be in contact with those sources directly and they will be helping me find out more about the Dilute Gene in the BLUEs. My testing will be done at UC Davis, a very Respected Animal research Veterinary School/Hospital. There is allot of information on UC Davis on the Net. Thank you for Joining me and I Hope my quest for information will help others with their desire to learn more about the Blue Malamute, and help educate people who do not know about the Blue Malamute, but would Like to own one. BE CAREFUL if you see an Ad advertizing a BLUE Malamute Puppy, ASK QUESTIONS and Stay informed. There are some who have taken Copies from other sites and posted it to their site to make it look like they have done the Research themselves, when they have not. My testing will be done at UC Davis, a very Respected Animal research Veterinary School/Hospital. There is allot of information on UC Davis on the Net. Thank you for Joining me and I Hope my quest for information will help others with their Desire to learn more about the Blue Malamute too. For anyone who believes they might have a Blue and wants to know for sure... Do your research. The test is not expensive and is well worth it. AKIVA AND GEORGIA ARE LITTERS MATES. AKIVA HAS BLACK PIGMENT AND GEORGIA HAS SLATE GRAY PIGEMENT Notice their Eyelids. Georgia has Silver Guard Hairs on her sides and Akiva does not. Eye Color is Different . Georgia has Hazel Eyes and Akiva's are Brown. 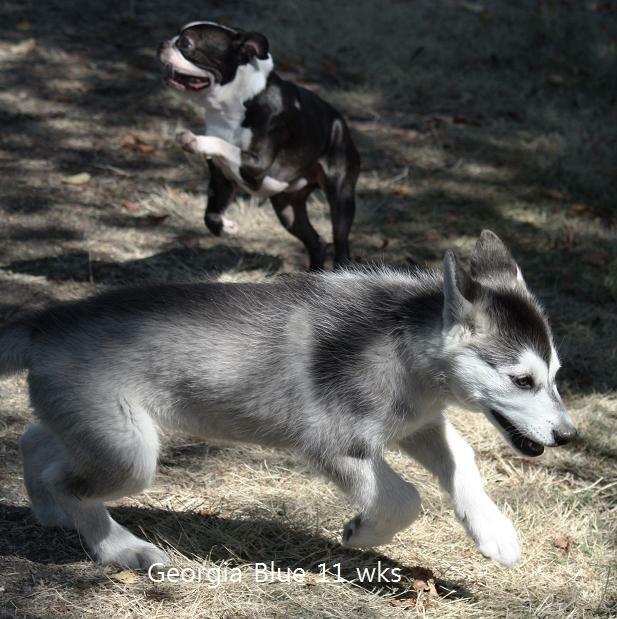 This Web site has allot of information on the Blue Malamute as well as two photo's Of Georgia Blue. New Photo's coming of Georgia soon. "This site belongs to Nichole Royer and I have her permission to add this page or link to my site." 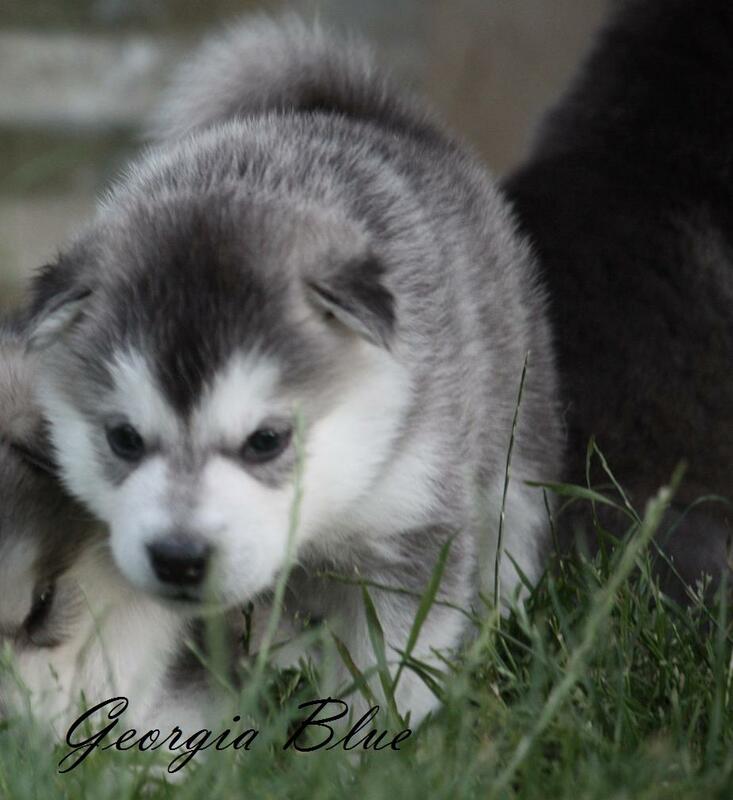 If you are looking for a Blue Malamute, Make sure that the Breeder you buy from, knows the Truth and has done the Research on them themselves, and can back it up. ASK FOR A DNA TEST on the puppy you are buying, if you are buying the Puppy because he or she is being sold as a BLUE.. 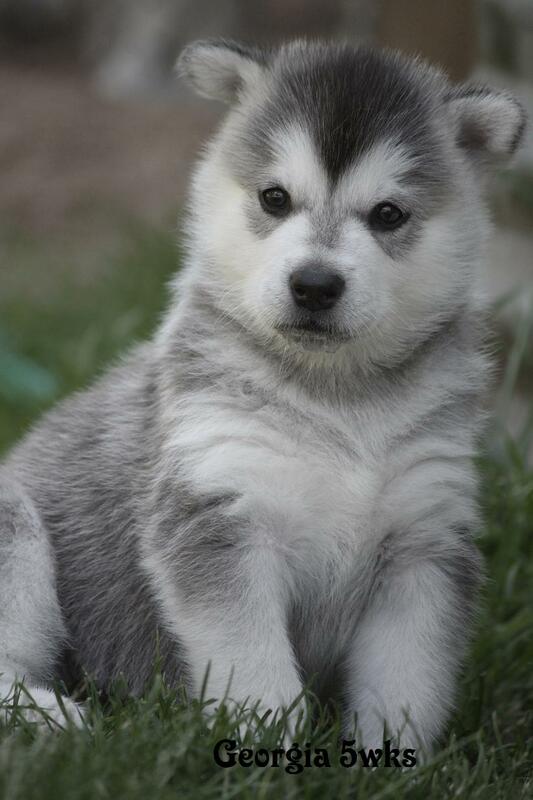 If they can not provide one, More then Likely The Puppy is NOT a Blue Malamute or the breeder has not done the research themselves. 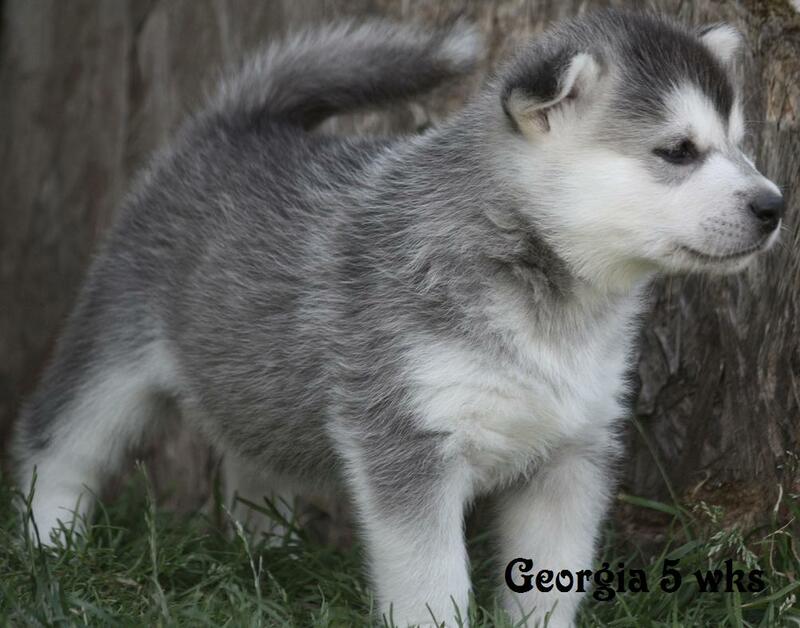 More then Likely trying to sell you a Puppy that is Gray or a standard Malamute Color, DON'T GET RIPPED OFF. I have Noticed since I have posted this information, there are Many more Blue Malamutes Available for sale. Just be careful and Ask the Breeder for Proof. (DNA Will be the only way for them to Prove it) Not that a Blue is any more desirable, but that they are rare in color, which makes them marketable at a higher cost to some breeders. The Term "RARE" seems to be a great Marketing tool for some people.